Auctioneer’s Note: True to its name, the “Victorian Secrets” estate offers graceful architecture and a private ocean side setting. 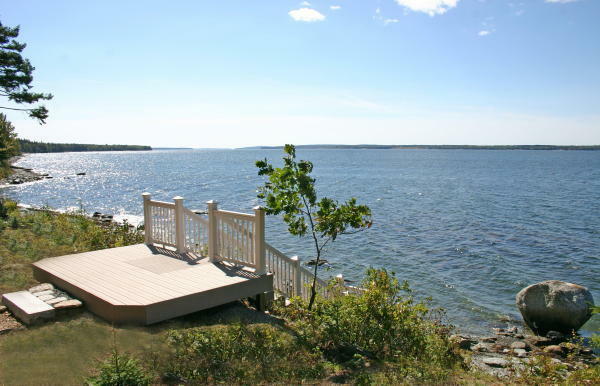 Located on Oak Point, the property enjoys wonderful views of the Blue Hill Mountains and Union River Bay, and is only 4+/- miles from Mt. Desert Island. Terms: A $50,000 deposit to bid, closing within 45 days of the public sale. All other terms and conditions of the sale will be available from the auctioneer. A 10% Buyer’s Premium. 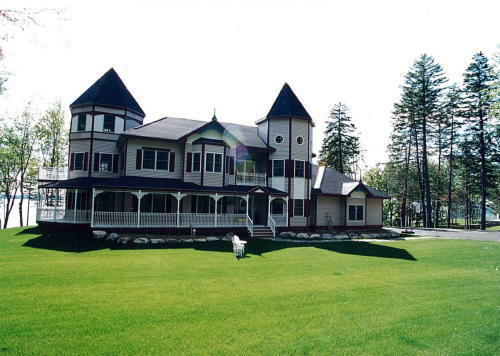 For a Property Information Package visit KeenanAuction.com or call (207) 885-5100 and request auction number 07-56. Broker Participation Program available. THE HOME: Constructed in 2000 to replicate a 19th century Victorian contains 9,000+/- sq ft including the 3-bay attached (heated) garage. The home is designed with 14 rooms, 5 bathrooms (3 full and 2 half baths). It has a 2,570 sq ft fully finished and heated walkout basement and family room that opens onto the oceanfront lawns with western views over the mile wide bay and Blue Hill Mountain. Breathtaking sunsets are a frequent event here! One approaches this home over Cottage Lane. The private paved drive winds through a groomed pine and spruce wooded area for some 600 to 700 feet before reaching the fieldstone walks which lead to the entrance to this lovely home. 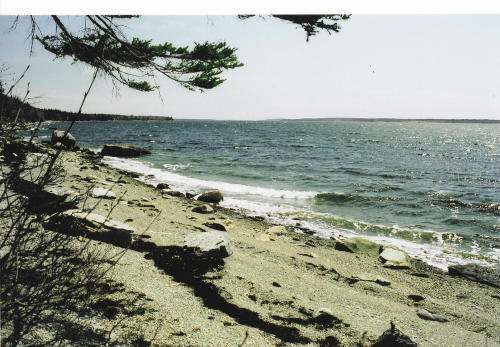 THE PROPERTY: Has 3.4 acres providing an expansive 400 feet of really excellent gravel beach and deepwater ocean access providing excellent mooring sites for watercraft of any size and draft. 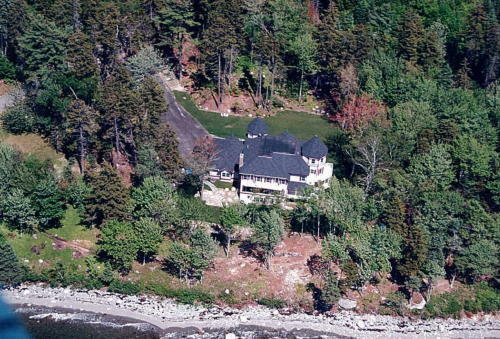 Maine, and this particular area of ocean offer some of the finest boating to be found in the world. 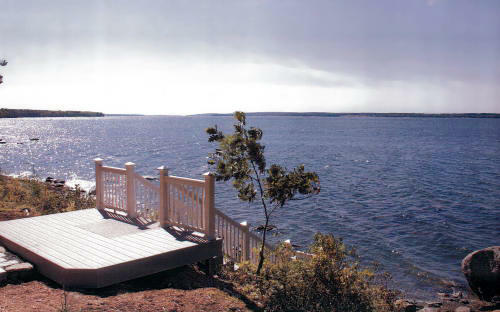 A deck area and stairs provide easy access to the beach from the lawn area. The property is served by underground electrical service. A large and legal septic and leaching system is in place. A private drilled and tested well with ample supply provides fresh water needs. THE LOCATION: The Town of Trenton, and this property, is approximately 6 miles South of the city of Ellsworth. Ellsworth is the County Seat of Hancock County, and provides the expected shopping centers, hospital, schools, veterinarians, and all the normal required services. The town of Trenton (Pop approximately 1,800) separates the Mainland from Mount Desert Island, and Acadia National Park, which contains some 40,000 acres, and is one of the most visited parks in the National Parks System and the only National Park in New England. 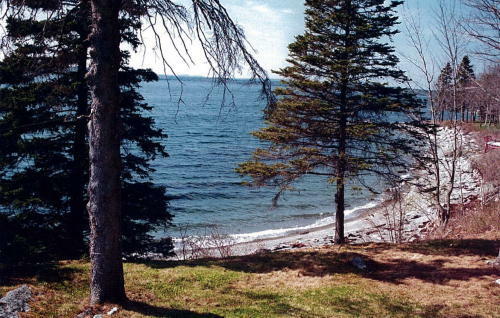 Somes Sound, said to be the only natural fjord in the United States juts deep inland between the towns of Northeast Harbor and Southwest Harbor. The towns and villages of this beautiful island are, Saulisbury Cove, Hulls Cove, Bar Harbor, Otter Creek Northeast Harbor, Town Hill, Somesville, Southwest Harbor, Bass Harbor, Tremont, and Bernard. Acadia National Park boasts of some 120 miles of hiking trails, 50 miles of groomed, graveled carriage roads for horseback riding, biking, skiing and snowmobiling in winter and the 27 mile paved Park Loop Road with such natural features as the Famous Sand Beach, the Thunder Hole, the Otter Cliffs, and the Bubbles at Jordan Pond. There is a winding paved road which reaches the top of Cadillac Mountain (the highest mountain touching the sea on the Atlantic Seaboard on the North American Continent) and which also claims to be the first place in the US that the sun touches when rising! There are two 18 hole and two 9 hole golf courses, and many fine restaurants nearby. 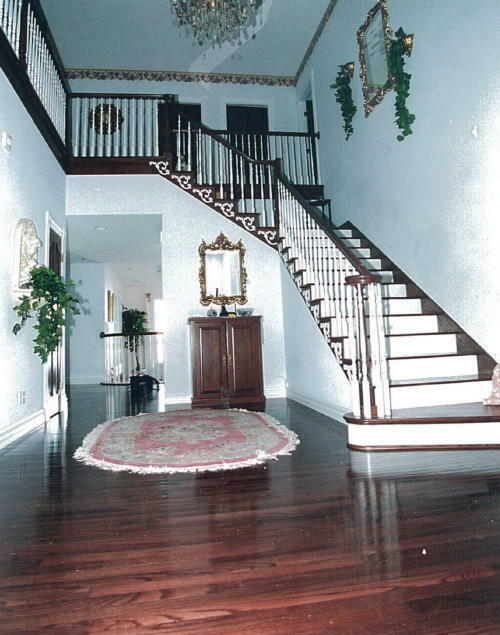 THE INTERIOR ARRANGEMENT: The large entrance foyer is open and expansive, with a wide and open stairway winding to the second level mezzanine, which encircles the foyer providing both wide and open access to all bedrooms and bathrooms. A huge crystal chandelier hangs from the second floor ceiling and is centered on the foyer. There is a guest’s coat closet as well as a half bath in the foyer. The ground floor level has 8 rooms. 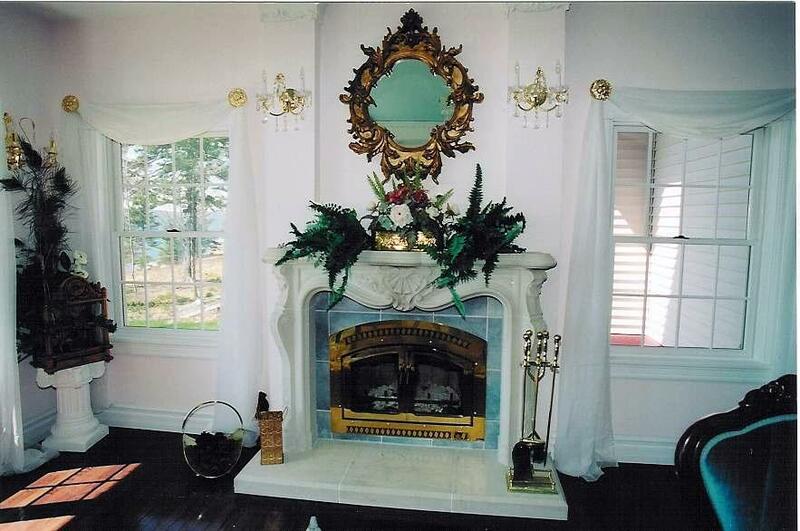 Straight ahead through the foyer is a large and formal step down Living Room with fireplace and a long windowed wall facing the ocean. To the right of the foyer is the office or library, which occupies the right hand turret as, viewed from the walkway leading to the entrance. To the left of the foyer is an open and wide entrance to a large and open den and step down media area (or you may choose to call it a Double Parlor). An open hall along the right side of this area passes two double closets and passes on into the formal Dining Room which occupies the left turret as seen from the driveway and entrance. The south wall of the Dining Room as well as the door opening onto the covered porch which encircles the home, is all glass windowed, making this a very light and pleasant room with ocean views from the dining table. Another door from the Dining Room leads to the Kitchen. The Kitchen has a corner sink window with ocean views, separate 180-degree hot water faucet, double sink, garbage disposal unit, ample cupboards and counter space, sit-up island counter and bar, broom closet, large closed door walk-in pantry with ample shelving, and a roll-top desk for the phone, your recipes, and menu planning center. From the kitchen you may pass into the Breakfast or a Lunch Room should you not wish to use the Dining Room. This area has space for a table and 4 to 6 chairs, a windowed wall facing the ocean and a glass windowed door, which opens onto the covered open porch. From the kitchen you pass down a wide, open hallway, which is separated, from the formal Living Room by a railing and balusters, (making this hall both light and open) passing two large double bi-folding door closets on the right. This hallway leads directly to the attached, very large, open, 3 Bay (separately zoned) and heated garage. On entering the garage there are two interior doors leading into the house, three steps up from the garage floor level. The door to the right enters the hallway leading past the Living Room to the Kitchen. It also passes a door on the left in this Hallway, which enters a Coat or Mud Room that has a deep sink. The other door gives access to another room, which may be used for tool storage, or a workshop area. A connecting door from this room opens into the Coat Room, so one may pass through into the hall. The garage floor has been sealed with an epoxy sealer and clear coated with a speckled finish for an easy to care for and dust resistant surface. There is an ocean view from the west garage window. The paved parking area in front of the garage provides ample parking for guests. Granite steps lead down to the West Lawns and the Oceanfront from the end of the paved parking area. THE SECOND FLOOR: The spacious mezzanine area which has rails and balusters around three sides provides an open, light and airy feeling to this area as well as providing access to all of the rooms of the second floor. Glass doors that are directly above the entrance door at the ground level provide access to a walkout-covered balcony overlooking the main entrance, and driveway. Straight ahead from the top of the stairway, and on the South end of the house occupying the second level of the south turret is the Master Bedroom Suite. This is a large area with ample room for its own sitting/TV area and a huge walk-in closet. A glassed exterior door leads from this second level turret to a second story balcony with room for chairs or a glider to enjoy the ocean views. 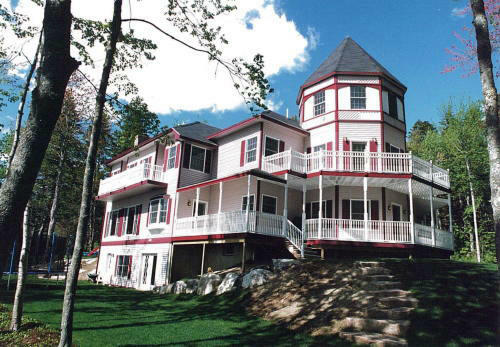 A circular stairway from this suite leads to the third level of this South Turret, with 240-degree views of forest and the ocean. Off this master suite is a spacious private bath, having separated and separate lavatories, ample cupboards and cabinets for towels and supplies, a step-in, corner canopied whirlpool bath with a corner window and ocean views, and an adjoining area with tub, shower, and toilet. Turning to the right at the top of the stairs… leads to two large oceanfront bedrooms, each having large double closets and private doors opening onto an open, railed balcony facing the ocean and West Lawns. These bedrooms share a bath with double lavatories, tub and shower. Turning to the left at the top of the stairs… passing along the mezzanine you would pass a small room called the Nanny’s Room. This room faces the East and the driveways. Continuing along the mezzanine you reach the 4th bedroom that occupies the second story level of the left or North Turret. This is a very light and airy room having a windowed wall facing the East and the sunrise, and has a very high and open turret ceiling. It also has a large closet, and a door opening into its own private bath. From inside the house this area is accessed from a doorway in the Foyer. It has some 2,570 sq ft total area. The west wall is at the ground level of the West Lawns, and faces the ocean, having windows along this entire wall with doors opening onto the lawn at either end of the West Wall of the room. It is carpeted, heated by in floor radiant heat, and completely painted out and finished. A partition with a see through opening separates the utility section. In this area are the washer/dryer, a deep laundry sink, a half bath, and a closet. It is also the area that the electric dumb waiter which accesses 3 levels of the house, and the separate laundry chute serving these same three levels, terminates. At the North end of this basement area are two rooms with closing doors. One is the utility room housing the System 2000 oil fired, hot water, in floor radiant heating system, which has been properly zoned, the electrical panels servicing the home, and the collection tank for the built in vacuum system which reaches all areas of the home. The floor in this room has been finished the same as the garage, with epoxy, sprinkled, and sealed to give it a neat and dust resistant finish. The second room which is opposite, houses the heating oil storage tank, with an outdoor fill pipe, the water filtration system, and the fresh water storage tank. THIS HOME HAS: Spacious rooms with wide and light hallways and foyer, ample closets and storage space and areas, well designed and thoughtfully placed interior and exterior lighting, wall outlets for electrical, telephone, cable, and computer outlets and terminals at all levels. A security system that monitors forced entry, fire, smoke, and low interior temperature. The main electrical panel is wired to accept the connection of a portable generator. Heating is by in floor radiant hot water heat at all levels to include the basement and the garage, and was carefully zoned for comfort. The System 2000 offers the very latest in heating technology. The 3-bay garage is both wide and deep to accept all vehicles. There are 3 remote controls to operate the doors. There is an intercom system having CD and radio capabilities in all rooms and living areas. There are two pull down attic stairs, one in the garage, and another in the walk-in closet in the Master bedroom suite.